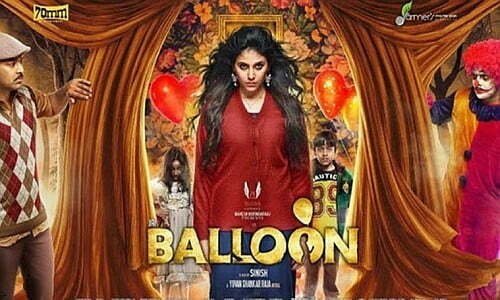 Balloon is a 2017 Indian Tamil language horror comedy film written and directed by Sinish and produced by Dhilip Subbarayan, Arun Balaji and Nandakumar. The film stars Jai, Anjali and Janani Iyer in the leading roles. Featuring music composed by Yuvan Shankar Raja, the film began production during June 2016, and released on 29 December 2017. This film got ordinary success at the box office. Balloon doesn’t break any new ground in the horror genre, but it adapts a bunch of the genre’s tropes — possessed kid, exorcism, revenge-seeking ghost and the like — to give us a solid horror film. In fact, right in the title credits, director Sinish lists out the films that inspired his — from Mama and The Conjuring to Poltergeist and It. This, in fact, feels like a wise strategy, because this open admission warms us up to the film’s derivativeness. And to Sinish’s credits, he has adapted elements from these films in a way that makes his film feel fresh. The set-up, in fact, feels autobiographical. An aspiring filmmaker who wants to make his debut film is advised by a producer to set his realistic script aside and make a horror film first. And so, the young man, Jeevanandham (Jai) sets out to Ooty, after hearing about a haunted house there, with wife Jacqueline (Anjali). Refreshingly, the inter-faith marriage isn’t remarked upon; it doesn’t play any role in the plot, but the matter-of-fact manner in which the director conveys this to the audience makes us trust him as a storyteller. They are accompanied by Jeeva’s two friends-assistants (Yogi Babu and Karthik Yogi), and his nephew, Pappu. However, eerie things start happening to them there, and one of them even gets possessed by a spirit, but it is only much later that they realise that these events have a connection with Jeeva’s past. Balloon works mainly because it has some solid scares (most of which are jump scares or variations of it), a lot of zingy one-liners (courtesy Yogi Babu, who is hilarious here) and a bit of inventiveness (especially in the second half, when the ghost toys with the villains). The filmmaking is also solid, with the technical team, notably cinematographer R Saravanan, whose frames give the film gloss, and sound designers Sachin Sudhakaran and Hariharan of Sync Cinemas, who amp up the scare factor without going overboard. And Yuvan Shankar Raja, whose name is credited after the director’s in the title credits signifying his importance to the project, comes up with an eerie theme and a score that is unsettling, though the songs, especially a duet between Jeeva and Jacqueline, only serve to increase the length of the film. The flashback portion, a standard thwarted romance involving Charlie the clown (Jai), his lover Shenbagavalli (Janani) and Joy, the girl who Charlie wants to adopt, doesn’t hit us hard enough emotionally, though it does tie-in with the film’s initial comments about fringe outfits intimidating filmmakers. The antagonists, which includes Moorthy (Nagineedu), a wily politician who will stop at nothing to rise in his career, are also hardly threatening that the film loses some intensity once it tells us why the eerie events are happening. Even the climactic twist feels perfunctory and doesn’t make us sit up, unlike the ones we got in films like Pizza and Maya.